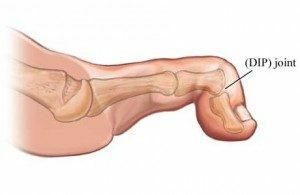 A hammer toe is a toe that’s curled due to a bend in the middle joint of a toe. Mallet toe is similar but affects the upper joint of a toe. Otherwise, any differences between hammer toes and mallet toes are subtle. Both hammertoe and mallet toe are commonly caused by shoes that are too short or heels that are too high. Under these conditions, your toe may be forced against the front of your shoe, resulting in an unnatural bending of your toe and a hammer-like or claw-like appearance. Relieving the pain and pressure of hammertoe and mallet toe may involve changing your footwear and wearing shoe inserts. If you have a more severe case of hammertoe or mallet toe, you may need surgery to experience relief. Proper shoe gear with wider shoes. Mallet toe is a digital deformity that occurs in the sagittal plane and affects only the distal phalanx. 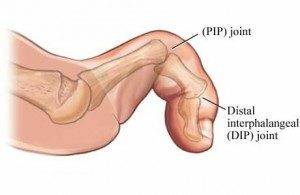 Usually, patients will see a callused area on the end of the toe and top of the last joint (DIPJ). Proper shoe gear with gel padding. Surgical procedure with a releasing the long flexor tendon (tenotomy) or distal phalanx arthroplasty. Heloma molles can develop between any two toes but typically occur between the fourth and fifth. They form when one of the toe bones (phalanges) is slightly too wide. Normal phalanges are hourglass-shaped, with their tips wider then the middle. Kissing corns result when the ends of the toe bones are too wide, causing friction in the interspace between the toes. A soft corn often develops because of this irritation. The problem can easily be aggravated by tight-fitting shoes. Even people with normal-shaped toe bones can develop soft corns. This condition is especially common in women who wear high-heel shoes, which shift the body’s weight to the front of the foot, thereby cramming the toes into a narrow, tapering toe box. Please contact the office if your insurance plan is not listed above.